Named after the friendly, one-eyed monster Mike Wazowski from the Disney-Pixar animated feature Monsters, Inc., this breezy eatery offers such a scary selection of soft-serve ice cream and spook-tacular toppings, you won't believe your eyes. Chill out with a super-cool refreshment! Inspired by the ice-creating hero from the Disney-Pixar movie The Incredibles, this poolside spot mixes up refreshing, frozen-fruit smoothies for the entire family to enjoy - morning, noon, and night. Set the stage for an evening of unforgettable entertainment at this snack bar located outside the Walt Disney Theatre. Pick up cookies, candy, cocktails, and popcorn before the show — or enjoy wait-staff service from your seat inside the theater. Savor classic Northern Italian cooking with a modern twist at this chic adult-exclusive restaurant — it’s a feast for the senses! Named after the signature long poles used by gondoliers in Venice, Palo serves Italian fare in an intimate setting. Feast your eyes on the magic of Disney animation at this restaurant that serves up a unique dinner show starring Disney characters. A savory fusion of Pacific Island foods, Asian cooking and fresh California fare paints a delicious culinary picture nightly. Stroll along a beach boardwalk boasting fresh food favorites for lunch and dinner—or savor table-service dining nightly. Cabanas is a novel, free-flowing buffet experience serving made-to-order mouthwatering specialties. Offering the most luxurious dining onboard, Remy is an adult-exclusive restaurant serving the finest French fare for dinner. A French-inspired menu of superior seasonal ingredients ensures dining at Remy is always a first-rate affair. Savor a market-style menu of flavors from around the world at this restaurant inspired by the gardens of Versailles. A seasonal menu of continental culinary contentment is always in full bloom — morning, noon and night. Looking to top off your tank? Make a pit stop at this outdoor eatery, home to 3 food stations — Luigi's Pizza, Tow Mater's Grill, and Fillmore's Favorites — inspired by Disney·Pixar’s Cars. Guzzle burgers, chicken, pizza, salads, and sandwiches. Feast like a king or queen on French-inspired, continental fare at this stately restaurant inspired by classic Disney Princess films. By regal decree, distinguished Guests are invited to indulge in a delectable menu of French and American cuisine daily. Bestow the little princess or prince in your life with a tea party starring Disney characters. Lady Chamomile, Chef Brule, and some popular Disney princesses welcome you to a dining celebration in your honor. Live performances shine in this glitzy high-tech theatre palace at sea. Watch Broadway-caliber productions in this grand performance venue aboard Disney Cruise Line ships. With its alluring ambience, the Walt Disney Theatre provides a dramatic setting that reflects a sense of excitement you might feel attending a star-studded gala. It is home to some of the finest entertainment in the cruise industry — from Disney original musicals to fun-filled variety acts. From blockbusters to Disney classics, watch a movie in state-of-the-art comfort and style. Inspired by the golden age of cinema, this grand movie theatre boasts Art Deco splendor. It’s a beautifully designed cinema showcasing first-run films as well as popular motion-picture releases and classic Disney films. Sing, dance, play games, and enjoy live entertainment as a family at this high-energy entertainment venue. Imbibe in a pre- or post-dinner cocktail at this sophisticated indoor and outdoor lounge situated between Palo and Remy. Overlooking the back of the ship, Meridian provides spectacular ocean-view seating. Set your sights on this Art-Deco-inspired café and Internet hotspot. Enjoy coffee and pastries in the morning or a pre- or post-dinner cocktail at night. You can also connect wirelessly or view your photos available at Shutters via an onsite kiosk. Ride a wave of relaxation at this open-air bar perched high on Deck 13. Offering commanding views of the sea, shore, and sunset, this breezy hotspot is the perfect place to sip a cocktail or beverage and simply take it all in. Swim against the tide at this laid-back bar located on Deck 12. Tucked beneath Goofy’s Sports Deck, this breezy spot - bedecked in nautical touches - is a great place to sip on a beverage while enjoying sweeping views of the sea, shore, and sunset. Toast to a good journey with a refreshing beverage at this sophisticated Art Deco retreat located in the grand Atrium. Serving cocktails, coffees, juices and sodas, this full-service bar is a great place to meet up with loved ones while at sea. Sip a drink and sightsee from your seat at this chic sky bar serving sweeping views of the world's most scenic horizons. Experience a high-style, upscale lounge with panoramic vistas of city skylines that magically transform from day to night. Be transported to Italy in this festive bar inspired by the country’s picturesque cities and decorative plazas. Anchor yourself at this relaxing, adults-only, indoor/outdoor lounge overlooking the Quiet Cove Pool. Find refuge with gourmet coffee, mixed drinks, and baked goods, or simply peruse a magazine, watch the flat-screen TV, or surf the Internet. Unwind at this romantic champagne bar with elegant décor — it's an enchanted, effervescent delight. Head underground for libations, dancing, and toasting “Cheerio!” in this British-mod nightclub. Be transported into a nightclub in the midst of Piccadilly Circus in swinging 1970s-era London. Share a pint and watch all your sports teams on TV at this rollicking, shamrock-sprinkled Irish pub and sports bar. The charming O'Gills Pub will have you feeling right at home - if you live in Dublin, that is. Sit back or splash it up at this family wading pool located on Deck 12. A little water goes a long way at this shallow “puddle” where kids can play while adults dip their toes. Use clues, technology, and good old-fashioned intuition to guide you on this interactive ship-wide caper. Do you have what it takes to help Mickey and pals discover whodunit? Get ready for a quacking good time as you careen through a water-gushing acrylic tube that takes you all over the ship! Developed by Disney Imagineers, this elevated “water coaster” is the first of its kind at sea. Enjoy a fully loaded workout facility sporting numerous group exercise classes, weight machines, and cardiovascular equipment. Fitness centers aboard Disney ships are expansive, state-of-the-art exercise clubs offering stunning ocean views. This open-air activity center features a miniature golf course, virtual sports simulators and a basketball court. A fun Mickey design, a winding waterslide, and a shallow depth make this pool a splashing good time for kids. Splash around, cool off and make new friends at this whimsical water play area for children 8 years of age and under. Little squirts will love getting wet while interacting with colorful characters from Disney·Pixar’s Finding Nemo. Move in your own tranquil orbit at this adult-exclusive wading pool. Satellite Falls is the perfect place to cool off after an afternoon in the sun. One of 3 freshwater pools aboard, Donald’s Pool is the place for family fun in the sun. Guests of all ages can splash out and cool off at this onboard oasis, a hub for recreation and entertainment. At this special salon, walk in as yourself and leave as a beautiful princess, courageous knight, or even a famous mouse. Get the royal treatment with hairstyling, makeup, and more, applied by your very own Fairy Godmother-in-training. Chart a course for Sea Treasures featuring nautical apparel and signature Disney Cruise Line collectibles that can only be found aboard Disney's ships. Drop anchor at Mickey's Mainsail to find specially-designed Disney Cruise Line merchandise, costumes, and accessories, for whatever floats your boat. White Caps is your one-stop sea-going shop, stocked with everything from sundries and fragrances, to designer handbags and fine jewelry, to tax- and duty-free premium liquor and imported cigars. Stroll through the Vista Gallery to view Disney Cruise Line art by some legendary Disney artists and collectibles featuring many of your favorite Disney Characters. Calling Guests of all ages: Partake in some competitive fun with a variety of games and convenient cashless play. At this action-packed arcade adjacent to Cabanas restaurant, enjoy the latest video games plus thrilling classics. Fun is always in the works at this sprawling water playground sure to delight every member of the family. “It’s a Small World” Nursery! Kids can romp, rest and do everything in between at this internationally themed childcare center. Parents can enjoy grownup time knowing their little ones are being looked after and entertained by expert Disney counselors. At “It’s a Small World” Nursery! youngsters from 6 months to 3 years old (or from 1 to 3 years old on Transatlantic, Hawaii, and Panama Canal itineraries) can play games, make crafts, watch movies, or even take a nap while you embark on adventures of your own. Children 3 to 12 years old can interact with Disney characters — and each other — as they explore multi-themed magical lands. Step into worlds inhabited by some of your favorite characters at this kids’ activity center filled with surprises. Children 3 to 12 years old can play and learn at sea through imaginative themed activities and games, offered daily. At this highly interactive space, play games, perform crazy experiments and discover all kinds of activities! Toys, Disney movies, and creatively themed areas with hands-on experiences will keep children 3 to 12 years of age engaged and entertained while adults embark on their own high-seas adventures. At this activity center just for tweens, watch movies, play games, craft and more with other cruisers your age. Now tweens have their very own place to play, make new friends, and participate in a variety of awesome activities! At this teens-exclusive space, chill out, listen to music, watch TV, play group games, and more with cruisers your age. 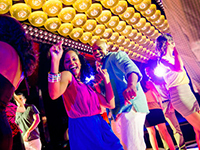 From teens-only dance parties to karaoke to just kickin’ it, there’s tons of fun stuff to get psyched about! Disney Fantasy offers the very latest in innovation and imagination. Entertainment aboard includes musical live shows, first-run films, Digital 3-D movies, and fun-filled family deck parties, available at lavish onboard venues each cruise day — and is unlike anything else offered on the high seas. Special, separate spaces have been created for cruisers of every age to let everyone enjoy their favorite things. Thrill to Aqua Duck, a 765-foot-long water coaster at sea. Kids will play in wondrous new areas created just for them. And adults can relax in spectacular themed entertainment areas. Guests can choose to pre-pay gratuities for their party up to three days before their vacation begins by contacting Disney Cruise Line; or, for the convenience of guests who have not pre-paid, the suggested gratuity amounts will be added to their onboard account, based on the length of the voyage as shown above. Guests wishing to modify or make changes to the gratuity amounts, or wanting to pay in cash, can stop by the Guest Services desk onboard at anytime during the sailing. Please note: a 15% gratuity is automatically added to bar, beverage, wine and deck service tabs. All gratuities can be charged to the guest's room. Guests can enjoy the flexibility and freedom of connecting to the Internet from their own personal wireless-ready laptop at convenient WiFi hotspots onboard. Specific information about WiFi hotspots can be found in the shipboard newsletter. Each Disney Cruise Line ship features internet cafés where guests can check email, surf the Internet, and share vacation memories while out at sea. Please note: External equipment such as cameras cannot be hooked up to the onboard computers. Computers are not equipped with any Microsoft® Office applications; attachments from email accounts associated with these applications will not open and cannot be sent. The computers also do not allow program or software uploads and downloads. Women who have entered their 24th week of pregnancy as of their embarkation date will be refused passage due to safety concerns. Neither a physician's medical statement nor a waiver of liability will be accepted. In addition, Disney Cruise Line cannot be held responsible or liable for any complications relating to pregnancy at any stage. Disney Cruise Line has never allowed smoking in guest staterooms. In addition, smoking is prohibited in all interior spaces throughout the ship. In an effort to provide a cruise experience that satisfies both non-smoking and smoking guests, smoking (including the use of electronic cigarettes) is only permitted in designated areas of the ship. Deck 4 port side, aft, the outside Promenade Deck from 6PM to 6AM only. Deck 12 port side, aft, the outdoor area that is accessible through the Meridian Lounge. Deck 13 port side, forward, by Currents Bar. Guests found smoking in their staterooms will be charged a $250 stateroom recovery fee to cover deep cleaning that includes air filter replacement, carpet extraction and the cleaning and replacement of drapes, comforters, blankets and pillows. Due to differences in size and the availability of some services while out at sea, policies will sometimes differ slightly. Disney Cruise Lines has carefully considered which areas of the ship to designate as smoking and non-smoking, and they do periodically review policies to ensure continued guest satisfaction. Disney Cruise Line can accommodate some special dietary needs, including providing no sugar added, vegetarian, low fat, low sodium, lactose free, and kosher meals at no additional charge. * Food-related requests will only be provided in table-service restaurants, not at quick service locations or through room service. Any food allergies, intolerance, or dietary requests should be brought to the attention of the Head Server prior to ordering. *Unfortunately, Disney Cruise Line may not be able to accommodate all special dietary requests. Please note: guests requiring a wheelchair throughout their cruise must make provisions for the use of that wheelchair prior to the cruise. Guests traveling with a wheelchair, electric mobility scooter, or electric convenience vehicles (ECVs) should consider booking a wheelchair-accessible stateroom. Typical staterooms have a narrower entrance door (25.5 inches) and may not have the necessary interior space for the device. Safety regulations require that all guests' personal equipment — including wheelchairs, electric mobility scooters and ECVs — must be stored inside guest staterooms when not in use. To ensure the safety of all guests, it is strictly prohibited to park personal equipment in corridors or stairwell landings. Once onboard, guests who find that their device will not fit inside their stateroom will be asked to park their equipment in an alternate location that may be several decks away from their stateroom location. Guests are responsible for parking their device in one of these designated areas when not in use. Transfer tiers are provided at one of the feature pools. Sand wheelchairs are available at Castaway Cay. Wheelchair accessible restrooms are available in the shipboard common areas. Assistive Listening Systems are available in the main theatres and show rooms. Open captioning is available for stateroom televisions and selected onboard video monitors. American Sign Language interpretation is available for live performances on various cruise dates. Stateroom Communication Kits containing door knock and phone alerts, phone amplifier, bed shaker notification, a strobe light smoke detector and a Text Typewriter (TTY) are available. Rotational dining is the Disney Cruise Line way of making sure that every guest experiences each themed dining environment on board. Every evening, you dine with the same tablemates and have the same servers as you "rotate" to one of three main restaurants: Animator's Palate, Enchanted Garden, or Royal Palace. Guests will receive a schedule when they board, which tells them exactly when and where to go, so they can experience the unique atmosphere of each restaurant. Children's menus are available in the restaurants. There is a health center onboard, and a physician and nurse are on call 24 hours a day to provide basic medical services on every cruise. The physician and nurse are employed by a company independent from Disney Cruise Line. Standard prevailing fees will be charged for all physician and nurse services. Onboard laundry and dry-cleaning services (with stateroom pickup) are available for a charge. There is a self-service Guest Laundry Room with coin-operated washers and dryers, along with detergent and ironing equipment. For safety reasons, the provided irons or steamers may be used in the laundry room only; personal irons cannot be brought aboard. Digital sports simulators are available at Goofy's Sports Deck, an outdoor activity center located on Deck 13. State-of-the-art virtual sports-gaming experiences include basketball, football, hockey, golf, soccer, and baseball. Disney Cruise Line® staterooms are among the first in the industry to be tailored especially for families, pioneering innovative comforts and modern features not found with any other cruise line. Ranging from cozy private lodgings and rooms with sweeping views, to grand and richly appointed suites, there's a category to fit every need. 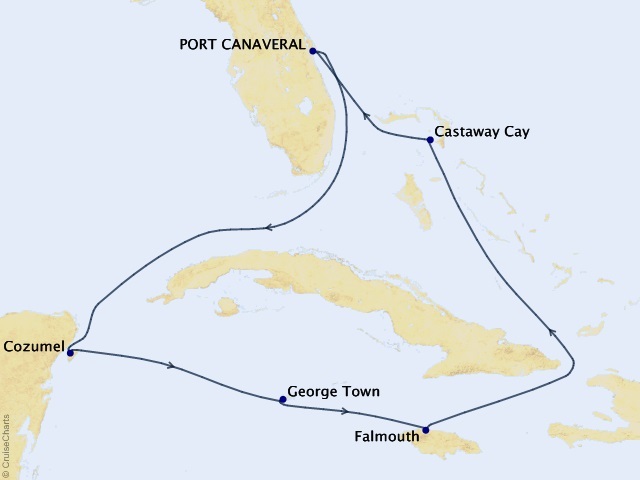 *Exact amenities described may vary slightly depending on stateroom location. One master bedroom with queen-size bed, one wall pull-down double bed, and one wall pull-down single bed, two bathrooms, rain shower, whirlpool tub, living room, dining salon, pantry, wet bar, walk-in closets. Sleeps 5. One bedroom with queen-size bed, living area with double convertible sofa, one wall single pull-down bed, walk-in closets, whirlpool tub, wet bar, two bathrooms with rain shower, private verandah. Sleeps 5. Queen-size bed, double convertible sofa, upper berth pull-down bed, full bath with round tub and shower, plus half bath. Sleeps 5. Queen-size bed, single convertible sofa, wall pull-down bed (in most) and upper berth pull-down bed (in some), split bath with round tub (in most) and shower. Sleeps 3-5. Queen-size bed, single convertible sofa, upper berth pull-down bed (if sleeping four), split bath with tub and shower. Sleeps 3-4. Guarantees a verandah stateroom to be determined by Disney Cruise Line. Queen-size bed, single convertible sofa, wall pull-down bed (in most) or upper berth pull-down bed (in some), split bath with round tub and shower (in most). Sleeps 3-5. Queen-size bed, single convertible sofa, upper berth pull-down bed (in some), split bath with round tub and shower (in most). Sleeps 3-4. 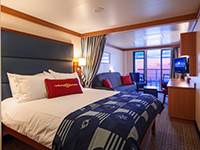 Guarantees an oceanview stateroom to be determined by Disney Cruise Line. Queen-size bed, single convertible sofa, upper berth pull-down bed (in some), split bath with tub and shower. Sleeps 3-4. Queen-size bed, single convertible sofa, upper berth pull-down bed (in some), bath with tub and shower. Sleeps 3-4. Guarantees an inside stateroom to be determined by Disney Cruise Line. Rates are cruise only, per person, based on double occupancy. Government fees/taxes of $123.61 additional for all guests. Rates are subject to availability and may change without notice. Restrictions may apply. Prices are per person based on adult double occupancy. Third, Fourth, and Fifth Guest prices available with two full-fare guests in the same stateroom. Government Taxes and Fees and excursions not included. Rates may vary by day of travel, season, duration and are subject to availability at time of booking.